The first time we saw Archie Kalepa was at the 2012 Olukai Ho’olaule’a event at Kanaha beach on Maui. We were on the beach waiting for our turn to ride on the new Olukai sailing canoe, Kamakani Eleu (the spirited wind). Lots of the Olukai team were sitting around talking story and we were fascinated. Little did we know the legendary watermen surrounding us, including Archie. By the time we flew across the swells we had a solid appreciation of the culture and spirit behind the teams who race these sailing canoes – and the Olukai team that brings the Ho’olaule’a experience to us all. What a surprise to find Archie’s presentation at Olukai’s TEDx Maui online. (see video below). Archie Kalepa, one of Hawaii’s greatest ocean sports pioneers, Hawaiian Lifeguard, and Director of Maui County Ocean Safety Division recently retired and joined the OluKai marketing team full-time as the Konohiki (caretaker). As the Konohiki, Kalepa will support and direct the brand in remaining authentic to the ocean lifestyle and respectful of the Hawaiian culture through hands-on participation in marketing activation.Who could be better at maintaining strong ties to the Hawaiian culture? Settling in front of my computer with a cup of coffee this cold Oregon winter morning I got both butterflies and inspiration from Archie’s compelling style of story-telling. He explained, “In surfing as in life you need to know where you need to be.” On a surfing canoe there is a huge difference between “riding” and surfing. To truly surf you need to know the lineup, study the wind and be where you need to be. We need to be adaptable and “crack the code” or find the formula for both challenging surf spots and – life. Archie’s true passion is using his skills to share the experience with friends while keeping them safe. With more than 30 years as a Hawaiian Lifeguard, this elite and humble waterman has saved countless lives, revolutionized lifeguarding today as one of the pioneers of personal-water-craft (PWC) and PWC sleds for use in tow-in surfing and ocean rescue, and became the trailblazer in establishing long distance SUP racing. In August of 2012, he was inducted into Outrigger Duke Kahanamoku Foundation’s Hawaii Waterman Hall of Fame, the highest honor a waterman can achieve in Hawaii. “Connect with your culture,” advises Archie. As a waterman or in everyday choices, life is like a big ride. 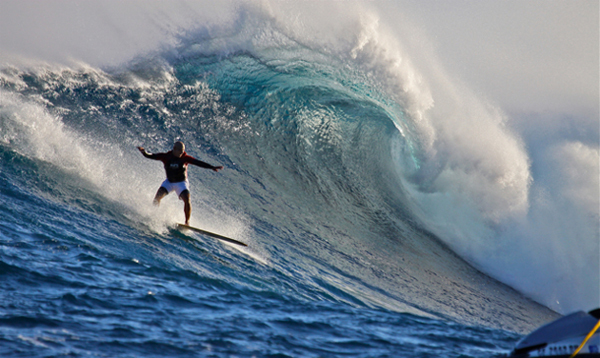 Talk about a big ride, Archie shared the story of his favorite ride on the iconic wave off Maui’s north shore, Pe’ahi. Because so many people visit Maui and go to the trouble to make their way through muddy and gullied dirt roads to take their place on the cliff to see (or more often not see) the break, Archie poses the idea that as a wonder of the world Pe’ahi should be recognized as such. Archie Kalepa: Foil Boarding from OluKai on Vimeo. We have written a number of articles based on “story,” – yours, mine and the collective “ours.” Humans love a great story and we all can recall a time when we were enlightened or entertained by an excellent story-teller. If any of you have heard of TEDx or follow the amazing short videos available online, you know the vast depth of topic and talent participating. One of my personal goals is to attend a TEDX in person. Fortunately, there are many opportunities for people in cities around the world to host their own, local version of the TEDx experience. We enjoyed TEDx Bend (Oregon) last year for the first time – and it was an exhilarating, sold-out event. 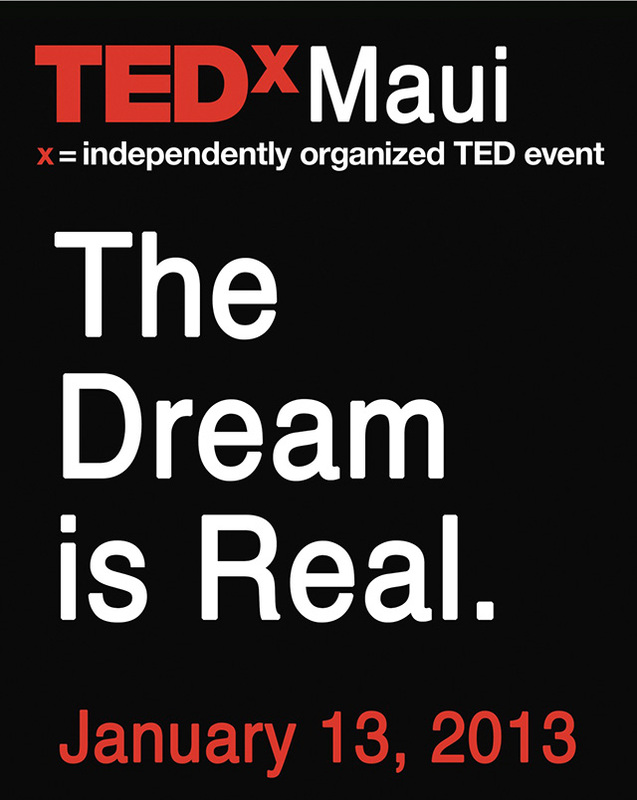 On January 13, we all have an opportunity to experience TEDX Maui, sponsored by Olukai. We’ve walked a lot of miles in our comfortable, top-notch Olukai sandals and shoes, and we’ve written numerous times about their “give back to community” company culture. It’s doubly fun to invite you all to join us in watching TEDx Maui online. Message us on Facebook if you plan to view and/or Tweet during the event. We’ll link to you. Similar to the mission of OluKai’s Talk Story series (an original collection of short videos and photography curated to inspire and connect people across cultures), the day-long conference will encourage global thinking and positive action with luminary speakers such as Archie Kalepa, mentor to OluKai, big-wave surfer and innovative waterman recently inducted to the Hawaii Watermen’s Hall of Fame; Alex Grey, visionary medical illustrator from Harvard Medical School whose art has been featured in Time, Newsweek, on the Discovery Channel and albums of Tool, Beastie Boys and Nirvana; Quayle Hodek, renewable energy expert named one of the ‘7 Hottest CEO’s’ by Treehugger.com and one of Red Herring’s ‘Top 25 Entrepreneurs Under 35;’ Jenelle Peterson, an inspired teacher who has taught in classrooms from Compton to Maui; and Kim Rosen, MFA, author of Saved by a Poem: The Transformative Power of Words whose work has been featured in media such as O Magazine and The New Yorker. “OluKai is the founding partner of TEDxMaui and we are honored to continue in helping create an enduring platform for inspired thinking,” said Kerry Konrady, Director of Marketing for OluKai. 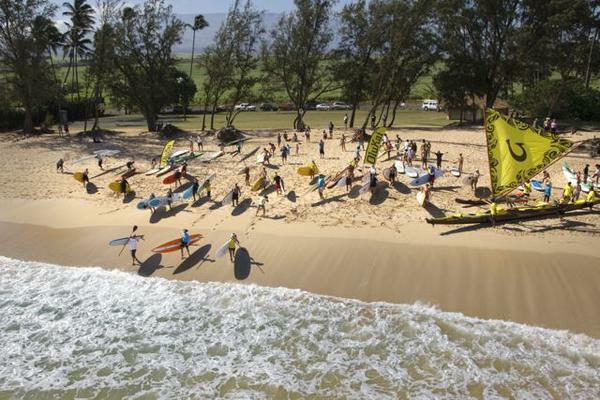 It’s all great – especially planning for the upcoming Olukai Ho’olaule’a May 11-12, 2013. The Journey to Maliko Gulch continues. We have been posting numerous articles since October 2012 documenting the on land training routine two 63 year-olds are following in order to be physically ready for the demands of the Olukai Ho’olaule’a race from Maliko Gulch to Kanaha. No matter how much land training we do, water time with the right equipment is crucial. Right now we own three standup surfboards (an 11’6″, a 10’6″ and an 11’3″). With winter closing in on our home town, water time on the snow-closed lakes is over. We can still paddle the quick-moving Deschutes River in temps above 35. Below that, ice on the deck pad (not to mention in the river) makes a SUP run less than desirable. Fortunately, we managed to save for a trip to Maui the first week of December (Happy Birthday, Ed and Merry Christmas to us both!). 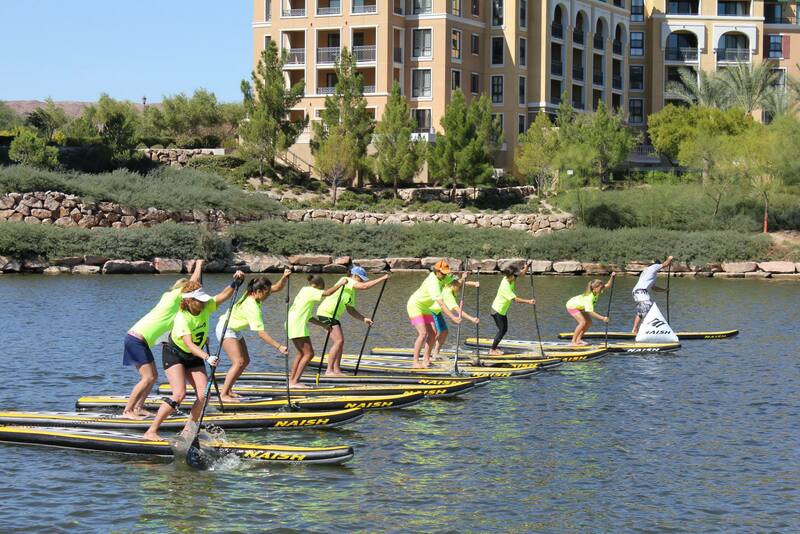 Our plan was to get some time doing down wind and some glide-training using the Naish 14′ Glide GS and the Glide 14’0 GX. Both of the 14’0″ Glides feature a low rocker displacement bow and a flat rocker bottom shape to increase acceleration with each paddle stroke. I am not the strongest paddler in any mix so when I get my technique as right as possible I want maximum ZOOM from the effort. Reading about increased acceleration with each stroke in one thing, putting together 10-20 paddle strokes that seem easier and more power-producing with each return – now that’s ZOOM! Maui is one windy place. Between the swells and the wind chop, I had some trepidation about going a long ocean distance on a race board with 27 1/4″ width. Standing still in wind chop did require a nice deep flex of the legs and a paddle in the water for stability. But once I got a rhythm going I was jazzed by how stable the Glide was. According to the description page on the Naish website, “The recessed deck provides a lower center of effort for stability to increase paddle power and gliding distance.” I’m glad the Naish designers got it right. The result is a ton of fun and very confidence-building. The Glide 14’0 GX features a carbon construction with wood reinforcement in the stance area. My experience and ability to perceive nuances between the Glide GS and the Glide GX is minimal. The carbon construction of the Glide GX really became dear to my heart when I lifted it for a carry up the beach or to load onto the roof racks. That GX is well-balanced and light. the hand-hold grip in the deck is set off center. I tried carrying with the grip high and then with it toward the low side. The low side worked well for my arm length – and the board carried so easily. The easy-to-manage feature of the Glide GX is just one reason to give the board a try. We all look at our budget and price during the decision-making process when it comes to adding boards to our quiver. The more I try and the more I learn, the “big picture” of function-fun-value has become the primary decision-driver. Okay, now for the high point of the first day on the Glide 14’0. At the halfway point of our 8 mile paddle, we were at a break called Rainbows off West Maui. The wind was relatively low and a swell of glassy, waist-high waves was charging toward a shelf reef at mid tide. It was a brilliantly clear mix of sea, sky and surf. I turned the Glide toward shore and waited for the second wave of the set. Paddling hard, I felt the Glide engage in the wave and before I knew it I was surfing sweetly toward shore. Stable as anything, I rode that small wall to the right until it began to fold into more turbulent foam. Uh oh, I was not on a surfboard and no amount of wishing was going to give me a bottom turn to the left. I bailed out far enough from the reef to be safe. Exhilaration! I know that when I’m on a down-winder with the Glide 14 I’ll be able to do what its name suggests: catch and connect the glides. And that’s what its all about! For a short video via GoPro: Disclaimer, it was my first day filming and first try at editing. Fun but not for prime time! Sometimes fate seems to send a subtle message in ordinary observations. This time it came from a name and the resulting initials – Suzie Cooney, SC. Ed and I are in week 8 of our “Eddie Will Go on the Olukai Ho’olaule’a” race – comeback from extensive shoulder surgery. Week 8 is the best one yet. 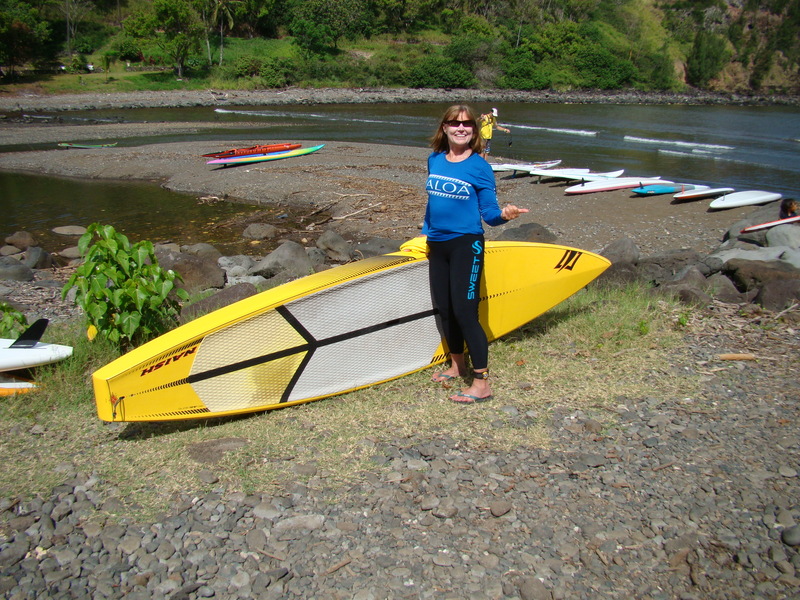 We are actually in Maui and are SUP surfing and doing sweet down-winders every day on our Naish 14′ Glide GX. Last night we had dinner with our trainer-from-a-distance, Suzie Cooney, CPT of Suzie Trains Maui. There’s nothing like a face-to-face conversation over ono burgers at the Fish Market Restaurant in Paia, especially after all the support we’ve gained from Suzie over the past months. How did two 63 year olds from Oregon come to be trained by Suzie Cooney on Maui? That’s quite a story. We were casually playing at down-wind riding while on vacation in Maui in May 2011. Hearing that the Olukai Ho’olaule’a offered a “fun race” of just 4 miles we grabbed our rental surfboards and registered. The day of the race we were all butterflies and doubt. Ed was having shoulder surgery 4 days later and we were second-guessing everything. Then the announcer gathered us all for a pre-race warm-up, and we met Suzie. With a warm smile and ultimate encouragement she talked and moved the nervous group through breathing, stretching and a warm-up. Surprisingly, by the time we were done the group had a relaxed and solidified feel. Then we were off for one of the most exhilarating fun-runs ever. We decided that when Ed was able to train after his surgery, just seven weeks ago, we would start training with Suzie. We set a goal to do the 8-mile run from Maliko Gulch to Kanaha. Suzie’s regimine has been just what Ed needed. SC – Sincere compassion: Ed is coming back from an injury and Suzie’s compassion for the struggle is obvious. It takes quite a bit of digging to gain the information that might attribute to that. Suzie is no stranger to injury, rehab, set-backs and the value of dedication and solid training. She has walked the talk, and then some. SC – Strategic communication: Suzie is about the busiest person I know. There is no place for the luxury of time wasted. When we use SKYPE or e-mail to gain insights and training strategies Suzie is always ready to communicate, but to the point and with disciplined replies. It is a great way to allow her expertise from Paia, Maui to reach out to wherever clients are. SC – Solid collaboration: Suzie spends time with a diverse group of peers from both the fitness and surf/SUP/paddling disciplines. She’s an avid listener and seems to have an uncanny ability to tweak out information and then share-collaborate easily. These skills are obvious if you cruise her website, see the photos, read the articles, and watch the well-edited videos. SC – Sea Connection: Suzie is a waterwoman and is undeniably connected to the sea. Her stories, grins, and passionate dedication to sharing this connection is a gift. We are better at our SUP dreams because of her inspiration. Better yet, we are determined to return home and make the most of the next 5 months before we launch into the sea from Maliko Gulch. Please share your training, come back and dream-event stories with us.